When you are facing a dental emergency, time is of the utmost importance. You do not want to waste valuable minutes researching “where is a dentist near me?” When you cannot find the information you need fast enough, you will probably be tempted to head to the local emergency room. However, the ER is not capable of diagnosing or treating your emergency. While the ER may be able to manage the pain, you want to avoid being in this situation. As an emergency dentist in 77077, we are here to help you avoid the hospital with the information you need to handle a dental emergency. No one ever expects a dental emergency to happen. As a result, most people do not know how to respond when in the situation, let alone have an emergency dentist in mind. While we hope you are never in an emergency condition, you need to plan for one anyway. You do not want to wait until the last minute to find an emergency dentist. When choosing a dentist for your family, ensure the one you choose offers emergency care, like Dr. Mark Gray. Dental emergencies can take many forms, which is why many people are unable to recognize what is a true emergency and what is not. For example, when an injury to the mouth occurs, it can be quite scary. However, the nature of the injury will determine if immediate care is needed. Injuries that require prompt care include knocked out teeth, dislodged teeth, and severely broken teeth. Receiving quick care is essential to promoting the survival of the tooth. Teeth that have been chipped do not require immediate care but do need to be treated within the next 12-24 hours. 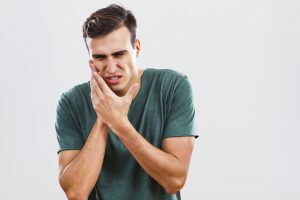 Other common emergencies include severe toothaches, abscessed teeth, broken dental work, or something stuck between the teeth. While these are the most common emergencies, they are not the only types of situations that can occur. If you are not sure if you are having a dental emergency, please do not hesitate to call our office. How you respond during a dental emergency plays a significant role in the outcome of the situation. You need to know how to correctly react during common emergencies. For example, if a tooth has been knocked out, you will need to gently rinse the tooth with only water by holding the tooth by the crown. If possible, try to reinsert the tooth. If you are not successful, place the tooth in milk and head to our office. When in an emergency, your first priority should be to control bleeding if any is occurring. Then, you will need to find any pieces of tooth that may have broken. Call our office right away so we can schedule emergency care while helping you properly manage the situation until your appointment. Dental emergencies are frightening. How well you are prepared to handle the situation will be vital to keeping you out of the ER. If you are having an emergency, contact our office right away.